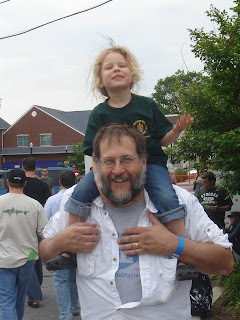 I finally made it to Iron Hill's Brandywine Valley Craft Brewers Festival this past weekend...after years of being thwarted by a wedding, travel, or other conflicts. I picked up my ticket Friday morning online at their website. When I checked back less than an hour later, there was a big "SOLD OUT" message across the webform. Almost missed it again, phew! The weather was as perfect as a beer festival could possibly ask for. Overcast turning to mostly sunny with a light breeze. The music of XXXXX (a little help, please?) rocked the parking lot and the closed end of State Street in Media. Joe Sixpack was signing books and talking with fans of his work. The Iron Hill clan was everywhere, as were other brewers, sales reps, and owners from over 20 local breweries and brewpubs. Scores of volunteers roamed the scene as well pitching in wherever necessary. There were a lot of usual suspects (beer, that is) floating around, so if you don't mind having a Tröegs HopBack, a Dogfish 90 Minute, a Sly Fox Royal Weisse, or a General Lafayette Chocolate Thunder then you were just sittin' pretty on this wonderful Saturday afternoon. And, c'mon, does anyone ever really "mind" having any of these beers or other "standards" from our outstanding local breweries? But, then, every few booths or so was something that just stood out a little farther (at least to me). Like the Rock Bottom Czech Mate Pilsner. Then, the Stewart's Abbey Hoffman. Or, the Dock Street Sexual Chocolate. Yes, you heard me correctly...just try asking Mike Fava for some Sexual Chocolate with a straight face! And, how could I not mention the River Horse Double White? New from their Brewers Reserve line, I was first wowed by it back at The Brewers Plate in March. It still fails to disappoint. If you haven't come across it yet, keep an eye open for it and don't pass it up. Then you get to the Iron Hill booth. These guys bring their A-game from one of their locations to the next; any naysayers, I challenge. If you came bearing a Mug Club membership card you received your choice from Bourbon Wee Heavy, Bourbon Russian, and Heywood. Sneaky of these guys to find a way to drive Mug Club membership sales on Saturday! I noticed a few people duck inside the restaurant to sign up in order to get to these special beers. All in all, the reputation of this festival isn't far from reality. It's planned well with cooperation from the borough, police, and brewers. Ticket prices are reasonable given the represented breweries and beers. Charity is involved in the form of the Media Youth Center. Rinse water was almost always available at each table. The event was not too crowded, so it was evident that the ticket sales limit was being observed. Tidbit from Iron Hill Gang: bottling day for Ring of Fire is in two days. 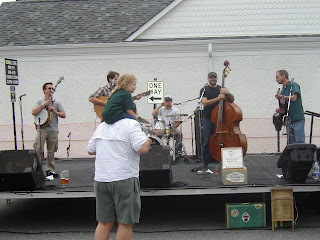 Tidbit from The Beer Lass: she's got way more pictures (and more fun pics, at that) than I took. Go check out her take on the day. Picture Prizes for you if you made it here to the end: If these pictures don't scream "family-friendly beer festival," then what does? I'm smelling another caption contest on the horizon. Anyone?